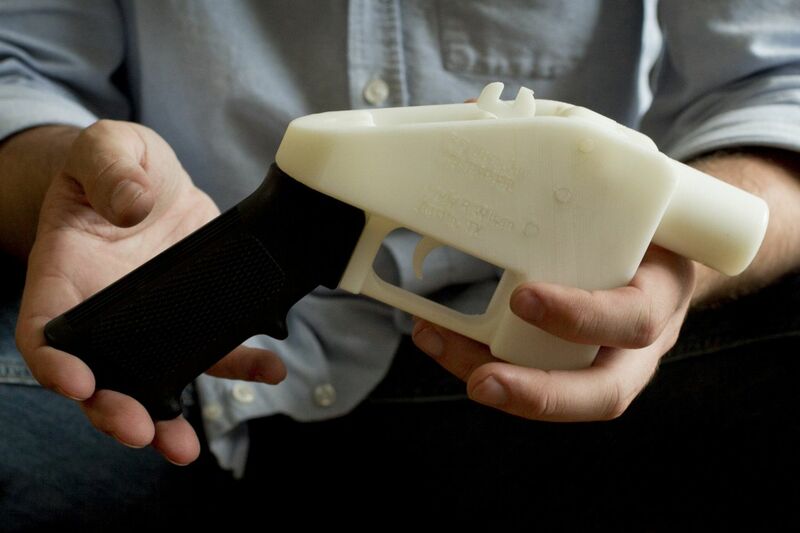 FILE – This May 10, 2013, file photo shows a plastic pistol that was completely made on a 3D-printer at a home in Austin, Texas. A coalition of gun-control groups has filed an appeal in federal court seeking to block a recent Trump administration ruling that will allow the publication of blueprints to build a 3D-printed firearm. In an emergency hearing in federal court in Philadelphia on Sunday evening, a Texas nonprofit agreed to block Pennsylvania internet users from downloading its files for making firearms with a 3D printer — for now. The hearing before U.S. District Judge Paul Diamond came in response to a lawsuit filed by state Attorney General Josh Shapiro, Gov. Wolf, and the Pennsylvania State Police. The Texas nonprofit, Defense Distributed, had put the plans for an AR-15 semiautomatic rifle on its website Friday, and as of Sunday, 1,000 people nationwide already had downloaded them, according to Shapiro's office. Had officials not gone to court to try to block downloads in the state, Shapiro said in a statement, "the harm to Pennsylvanians would have been immediate and irreversible." In New Jersey, officials also had sought to block downloading of the plans for that state's residents by means of a cease-and-desist letter. But Defense Distributed challenged that effort on Sunday by filing a federal lawsuit in Texas. In a telephone interview, Defense Distributed director Cody Wilson said that although the company had temporarily agreed to prevent downloading of any gun files in Pennsylvania, it would fight any effort by state officials to seek a permanent ban. "Americans have the right to this data," Wilson said. "We have the right to share it. Pennsylvania has no right to come in and tell us what we can and can't share on the internet." In its statement, Shapiro's office said it would continue to pursue a more lasting solution in the form of an injunction. 3-D printers allow a user to "print" objects in plastic, with a heated nozzle that can travel left, right, up, and down, following specific instructions contained in a computer file. Defense Distributed was making its gun plans available to anyone who obtained a membership by paying a nominal fee, according to the lawsuit filed by Shapiro and Wolf.